If a loved one passed away as a result of fatal workplace illness or injury, you’re up against plenty of uncertainty. You may be facing costly medical expenses that your loved one accrued, the loss of a significant income stream for your family, and unexpected bereavement expenses. All of these factors can add up and put families in a dire financial situation. Survivors’ benefits provide much-needed financial relief to Cincinnati families in the midst of a painful loss. While these benefits can’t make up for the loss that you’ve already experienced, they can be a useful resource to keep you financially empowered as you plan for the future. The best way to secure the benefits that you need is to speak with an experienced and compassionate lawyer. The team at Lawrence & Associates has the legal skill and knowledge to help your family secure the benefits that you need. We understand just how difficult filing for benefits can be in general, let alone when you are grieving. As a trusted resource for many Ohio and Kentucky families, our lawyers focus on taking care of legal and administrative issues so that our clients can focus on their families. As the surviving family member of someone that died from an occupational illness or injury, you have options. To learn more about what these options are and how the workers’ compensation lawyers at Lawrence & Associates can help, call us today at (513) 351-5997. Do I Need a Survivors’ Benefits Lawyer? Survivors’ benefits in Ohio can help alleviate the financial burden brought upon your family by the loss of your loved one’s wages and any expenses related to their death. Having a skilled lawyer to help you navigate the process of claiming benefits will give you time to focus on any other arrangements and plans that need to be accounted for following a death in the family. A skilled Cincinnati lawyer can help give your family some clarity on exactly how much you can claim for death benefits. Depending on your situation, understanding your eligibility can be confusing, and a lawyer can be extremely helpful in this regard. Also, an experienced lawyer can make sure that you meet crucial deadlines for the initial filing or appeals processes. When securing these benefits, timeliness is an important consideration. Filing for benefits often includes detail-oriented tasks like compiling and organizing necessary documentation. Unfortunately, coupled with arranging a funeral or any related memorials, families may miss crucial deadlines, disqualifying them from receiving the benefits they need. If your initial claim for death benefits is denied, your lawyer can also help you appeal this decision. With the guidance of a lawyer, you will be able to share the burden and feel confident that your affairs are being looked after. Losing a family member to a work-related illness or injury is stressful enough, so being able to lean on a skilled legal team is a source of relief and comfort for many families going through difficult times. The experienced workers’ compensation lawyers at Lawrence & Associates take pride in helping families navigate difficult issues. We understand how heavy life can feel in the midst of a devastating loss, and through compassion and excellent legal support, we aim to help families collect the compensation that they need. 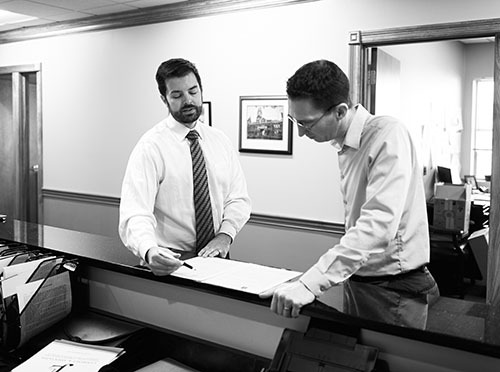 Over the years, we have dedicated our practice to working on behalf of Cincinnati workers and their families because we know the difference that quality legal representation can make on the outcome of a case. Our team represents a wide variety of cases across multiple legal disciplines, and the mission of our firm is to help people. We work for families in both Ohio and Kentucky, making our legal team available to as many people as possible. We know that you have plenty of options when looking for a lawyer in Cincinnati, and we aim to prove to those who decide to hire our team at Lawrence & Associates that they made the right choice. Above all else, our lawyers value client satisfaction. Reaching out for legal help is something that many people find difficult for a variety of reasons. Many cases are sensitive and extremely personal and entrusting your financial well-being to a team of lawyers can be hard. We partner with our clients and aim to gain trust by remaining accessible and communicative throughout the whole process. The family of an Ohio worker is able to file for death benefits once their loved one has passed away. Death benefits are typically built into workers’ compensation programs and available to family members even when their loved one’s death wasn’t the result of negligence on behalf of the employer. Death benefits are meant to help ease the financial disruption of lost wages and potentially provide ongoing support for surviving dependents until they come of age. Funeral expenses up to $5,500 may also be covered as part of the death benefits, according to the Ohio Bureau of Workers’ Compensation. These family members are considered financially dependent on the deceased worker and are, thus, eligible for collecting survivor benefits. In some cases, families may be eligible for ongoing benefit payment. This, however, depends entirely on the family’s unique situation, but a lawyer can help clarify. Filing for death benefits can be done in a variety of ways. A lawyer can help you figure out the best way to file based on your particular situation. Whether your loved one’s employer was self-insured or obtained insurance through the Ohio Bureau of Workers’ Compensation could affect the actions you take in seeking benefits. In order to ensure that the process goes as smoothly as possible, a lawyer can help you figure out the right course of action to take and gather the necessary paperwork. Filing for survivors’ benefits after a loved one’s death can be overwhelming, and the attorneys of Lawrence & Associates can help. Following are answers to some frequently asked questions, and we are available to discuss your case and answer specific questions when you call us at (513) 351-5997. If the deceased was already receiving workers’ compensation benefits before death in the form of temporary total disability or permanent partial disability, then the insurer may pay out the remainder of these benefits to eligible parties. Who is Eligible for Accrued Compensation? A dependent, such as a surviving spouse or children, are eligible for accrued compensation. Additionally, parties responsible for covering expenses related to the deceased worker's funeral or related services, whether it’s a provider or an individual, may be able to collect accrued compensation. Lastly, if the worker has no dependents or provider, the accrued compensation may go to the estate of the deceased worker. How Are Death Benefits Distributed? Numerous factors can be considered when determining the distribution of death benefits. Typically, a significant factor is the level of dependence that surviving family members had on the worker before they passed away. This dependency will likely factor into the amount of the benefits they receive. Ohio law gives surviving family members two years to file for the death benefits that they need following a loved one’s passing. While this time limit gives families a suitable amount of time to grieve and sort through their affairs, the process can take a bit longer than some families would prefer. It is best to file sooner than later to ensure that you can recover the benefits that you need promptly. Is a Survivor Benefits Lawyer Expensive? The survivor benefits lawyers at Lawrence & Associates work on a contingency basis. This means that unless we help you recover the resources that you need, you don’t pay us. Our payment is tied directly to the success that we have on you and your family’s behalf. When we help you recover the money that you need, we receive a small percentage of the total. If you’ve lost a loved one in Cincinnati to a workplace injury or illness, you do not need to navigate your situation alone. It is completely natural for you to feel overwhelmed at this time, but know that a competent lawyer is ready to help if you are considering filing for survivor benefits. The team at Lawrence & Associates can help you seek the resources that you need to alleviate your financial circumstances. We understand that each situation is complicated and unique in its own right, and we are ready to learn about yours. To find out more about how one of our lawyers can help, call (513) 351-5997 today and schedule a free consultation.